"Gangster Squad" has all the flash and bangs to make it an enjoyable watch but as a gangster film worth remembering it is not. Unfortunately, the film is stifled with lackluster writing often passing substance, plot and character development with violence and action. Sadly, "Gangster Squad" is more or less a hit-or-miss affair. Some would love it just for the action alone but more would likely hate the seemingly far from historical vibe and the seemingly uneven pace. 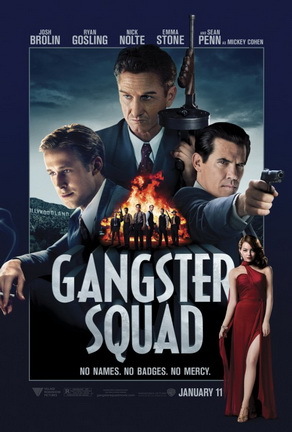 The thing we most hate though is that "Gangster Squad" could have been way better than its current state. Simply put, "Gangster Squad" comes out more like your run-of-the-mill gangster film. In 1949, Brooklyn-born gangster Mickey Cohen (Sean Penn) has become the most powerful criminal in Los Angeles and intends to continue to expand his criminal enterprise across the Western United States even forcing out his rivals in Chicago. Cohen has complete control of L.A. as he has bribed both the court and the police. After saving a young girl from Cohen's thugs, Sgt. John O'Mara (Josh Brolin) is personally selected by Chief Bill Parker (Nick Nolte) to wage war on Cohen - a war to dismantle Cohen's crime empire and force him out of L.A. O'Mara then recruits officers he deems "clean" enough to do the job. He is joined detective Coleman Harris (Anthony Mackie), wire-tapper Conway Keeler (Giovanni Ribisi),legendary sharpshooter Max Kennard (Robert Patrick, Kennard's partner, Navidad Ramirez (Michael Peña) and Sgt. Jerry Wooters (Ryan Gosling). As the Gangster Squad hits Cohen hard, can they finally finish the job and stop the egomaniac madman who has controlled Los Angeles and intends to do more in the very near future? What "Gangster Squad" lacks in depth it overcompensates with action, gore and some comedic vibe. The unfortunate thing is that it does not really hide its imperfections. Although we could honestly say it helped, we still wish it could have and should have done more. Two of our biggest gripes is the sorely missing plot and character development. Scenes and characters pop in from situation to situation - feeling like they have forgotten how dangerous their situation is (or the film is seemingly taking the easy way out almost every single scene). Also, viewers never get to know characters as well as they should and some members of the squad didn't get enough screen time. Even the love angle between Ryan Gosling and Emma Stone is botched. It feels such a waste because the film had excellent portions in its hands. The superb acting from the cast especially Sean Penn as the power-hungry Mickey Cohen is moving and chilling. The action-packed, guns-a-blazing action scenes are something to behold as well. The film just feels like its wrapped in nice and expensive paper but the contents of it are actually mediocre.